It is most popular in Greece. Topics: Services, Serviced Offices & Executive Suites, Hotdesking, Meeting Rooms & Boardrooms, and Virtual Office- Business Address. The estimated 187 daily visitors, each view 2.50 pages on average. It is hosted by American Registry For Internet Numbers (Virginia, Chantilly,) using Microsoft-IIS/6 web server. 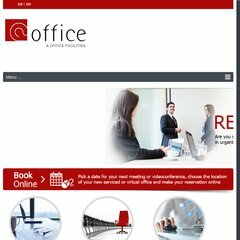 A-office.gr's IP address is 69.10.157.105. There are 2 Nameservers, ns2.lighthouse.gr, and ns1.lighthouse.gr. PING quad-web.lighthouse.gr (69.10.157.105) 56(84) bytes of data. Website load time is 2079 milliseconds, less than 70% of other measured websites. As well, a ping to the server is timed at 76.4 ms.